If you read Kevin Hoover's report in this week's Arcata Eye about on what's going on at KHSU, you came away with some unanswered questions. Hoover raised a slew of concerns and put them to HSU V.P. for Advancement Robert Gunsalus via cell phone (Mr. G is on vacation). Hoover noted, "During a fragmented conversation marked by static and dropouts, Gunsalus declined useable comment on most questions. Most responses were, at his insistence, off the record and unreportable. On-the-record comments tended to be somewhat bland and inspecific." I’ve been looking carefully at the many questions that have come up since the July 16 announcement of Elizabeth Hans McCrone’s departure as KSHU’s [sic] general manager. It seems to have caused unfounded fear and rumors about the station’s future. I want to put that fear and those rumors to rest. As soon as it was possible, I met with the station’s staff and I sent a personal message to the station listserv. A press release was also sent to all local media. However, many questions have been raised since then, and I thought it would be helpful to address what seem to be the main concerns. First and foremost: Humboldt State University is fully committed to KHSU, and will remain so for many years to come. 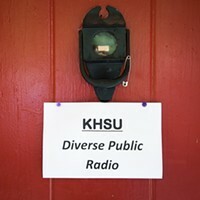 KHSU’s license is not up for sale and the station has a bright future ahead of it as the most listened-to station on the Redwood Coast. We are proud to provide this public service to our community. There are also no immediate plans for changes in the programming at KHSU. I cannot stress that enough. At the same time, we are constantly reviewing, revising and questioning our programming, striving to better meet the needs of our listeners. 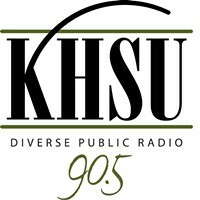 That is a necessary process if we are to remain relevant and fulfill our mission, which begins: "The mission of KHSU-FM is to educate, enrich, enlighten, and entertain people throughout Northwestern California and Southwestern Oregon by providing innovative, high quality public radio programming." We are exploring options for leadership of the station. Program Director Katie Whiteside and Director of Development Pam Long are assuming joint responsibility for management of the station on an interim basis. I have confidence in their abilities, and both will continue with those additional responsibilities during the transition. We will seek to build on KHSU’s solid and continuing success. In terms of both listenership and dollars raised, the station remains number one in its market. Our initial reports show membership is up $4,260 over last year, and underwriting from individuals and businesses increased $14,000 over the last year. Listeners, businesses and local organizations provide more than half the station’s annual operating budget. For its part, in addition to space on campus and general oversight, Humboldt State provided the station with $170,500 from the general fund in 2007-08. This provided salary for the station manager and an engineer, as well as funds for supplies and equipment. I have heard questions about the handling of KHSU’s reserves and I want to allay those concerns. Humboldt State has always had responsibility for fiscal and operational oversight for KHSU. Funds designated for KHSU have always been directed to KHSU and that will continue. As part of my oversight of the station, I have been focused on helping it achieve a sound and sustainable financial footing. Radio stations need to maintain a sizable reserve for emergency equipment needs, long-term equipment renewal, and planning. That is why I recently directed the general manager to transfer a portion of the station’s $300,000 in reserves from a non-interest-bearing checking account. Holding the funds in that account had meant an ongoing and considerable loss of income for the station. Now, KHSU is earning a return while still having access to funds it may need in the short term. A significant portion of the reserve is in a money market fund earning about 4 percent interest and a sizable portion is in longer-term investments for stable funding in the more distant future. On a related note, I know there are also queries about the recent change we’ve made in handling KHSU donations. This is an administrative efficiency that will provide the station with better data support and save it money. It is solely an administrative change that applies the Advancement (external affairs and fundraising) Office’s expertise and equipment in managing donations designated to KHSU, as it does with dozens of other entities associated with the University. This takes a burden off station staff, saves the station money, and provides better data support. Underwriting responsibility remains at the station. Hundreds of designated funds are handled just the same way at Humboldt State. I’m always happy to share information with you about KHSU. As always, we welcome the community’s thoughts, suggestions and support as the station proceeds on a successful path forward.